Knowing what your association members think, want, and need is paramount in connecting with them about your offerings. But unless you’re listening attentively to their every comment on community boards, social media, in article commentary, and on product reviews, you’re going to miss key metrics about how engaged they are. 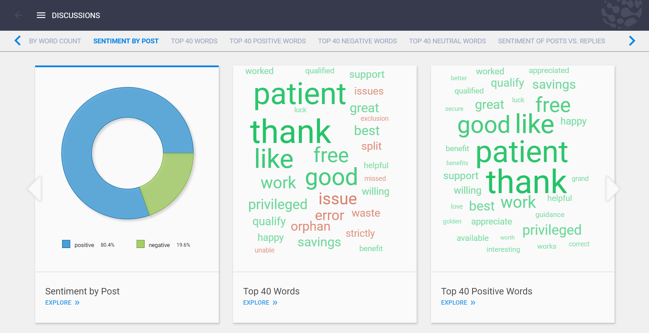 Analyzing overall sentiment through automated text analysis helps you quickly understand how engaged your members are and how they’re feeling about your organization, products, or services. Feedback and research from the Nucleus client community indicated that sentiment analysis is valuable because it provides a measure of member engagement. In response to that client feedback, text/sentiment analysis has been added as a Nucleus core product feature and is generally available immediately to all clients. Text/sentiment analysis provides a measure of how members are feeling, individually or as a group. Sentiment analysis looks at how something is being discussed and whether the sentiments are positive, negative, or neutral about them. This type of analysis allows you to visualize how people feel about your organization, product, or service, and gives you an understanding of what needs to shift to make the sentiment more positive. Nucleus can process textual data from any source to assess sentiment. After parsing statements through natural language processing (NLP) and keywords, and processing them through our pipeline, you can have automated (and easily presentable!) sentiment analysis reports automatically generated. Tracking sentiment can add breadth and depth to your data and help flesh out why your members or prospects are responding to your organization or offerings in the way they are. Instead of just looking at the ones and twos of registrations or dues payments, knowing objectively how happy an individual is with your organization can help your membership or marketing teams turn them from someone who might be on the fence of renewing, to renewed and actively engaged if you can speak to their desires or frustrations more readily. Join our session, “What Are They Thinking?! Gain Better Insights Through Community Data” at the Higher Logic Super Forum this Thursday, November 8 from 9-10am ET to hear how we helped 340B Health with their sentiment analysis efforts or schedule a demo.